Kawasaki Teryx 4 Review and Guide. Guide to Kawasaki Teryx 4 Models. The Kawasaki Teryx 4 was an all new model line in 2012. The four seater UTV segment has been a big hit in general, and the Teryx4 has been a big seller for Kawasaki too. With a year behind it, we thought it was a good time to see how the Teryx 4 looked for 2013. We don't normally recommend buying the first year model of anything, so we were really waiting for the 2013 Kawasaki Teryx 4 model introduction. Now it's time to take a serious look at what Kawasaki calls an "RUV" (recreational utility vehicle). 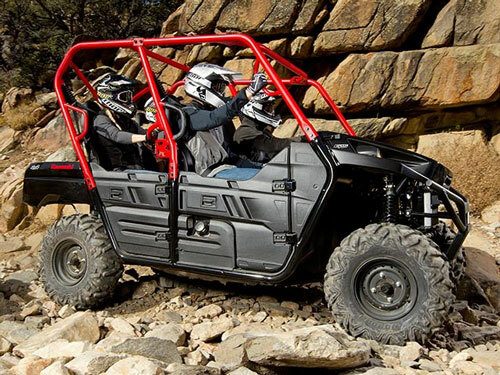 The Teryx4 seats 4 comfortably while being very maneuverable. Kawasaki Teryx 4 - What's Different? Even though the Teryx 4 looks a lot like the 2 seat Teryx, there are some major differences. Let's get those out of the way first. 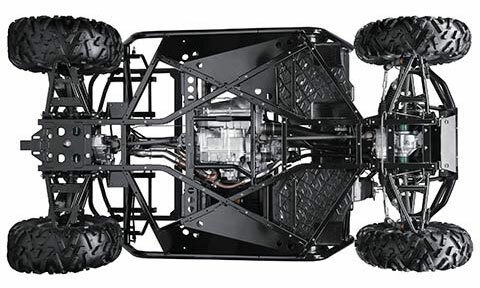 New Teryx4 frame features double-x construction and extra width. If you're going to build a four seat UTV based on a two seat model, you'll have to start with the frame. There are two choices, stretch the existing 2 seat frame, or design an all new one. Kawasaki did the right thing and went the all new route. By doing so, they were able to provide roomy seating for four adults, while only increasing the wheelbase 10 inches over the 2 seat Teryx. A new double X-brace design increases stiffness to preserve good handling and frame strength. 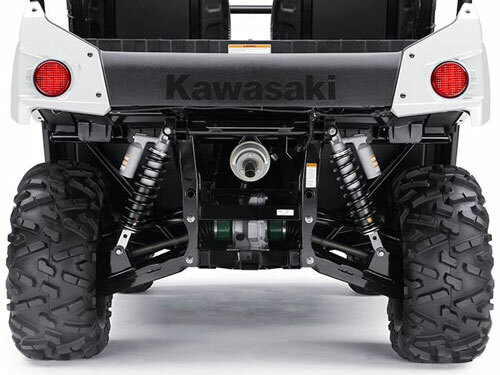 One of our favorite new features of the Kawasaki Teryx 4 was the EPS (electric power steering). It was offered on upper tier models in 2012, but has been made standard on all models for 2013. The 749cc V-twin is the same basic engine found in the standard 2 seat Teryx. Power is up by about 15% for the Kawasaki Teryx 4 models. The increase comes from some old school hot rodding tricks. Compression is raised from 8.8 to 9.3, throttle bodies are 2mm larger, cams and exhaust headers are upgraded, and more fuel is supplied by higher capacity injectors. Don't ask about fuel economy, but there's a good reason for the larger fuel tank. To put the extra power to good use, Kawasaki has added a wet, multi-plate, centrifugal clutch to the CVT transmission. That translates to much better throttle response, especially at lower speeds and tedious conditions. It virtually eliminates slippage of the CVT belt, which increases life of the belt tremendously. Kawasaki also dropped the vintage, hand controlled front differential and joined the 21st century with an electronically controlled unit that has a switch mounted in the dash. You can switch from 2wd, 4wd limited slip, and fully locked 4wd. 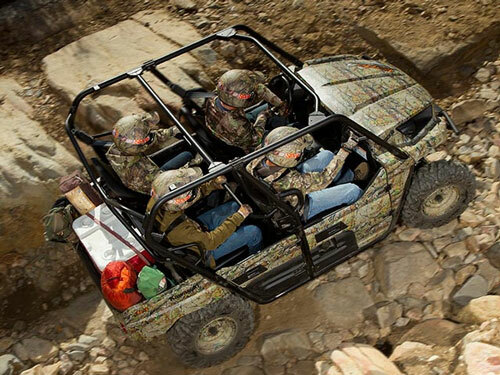 The Teryx4 is the shortest 4 seat UTV, but has plenty of room for 4. The Kawasaki Teryx 4 is a modern miracle of packaging. While the Teryx4 is only nine inches longer than the 2 seater, Kawasaki was able to find room to fit four bucket seats with plenty of room for four full size humans. There's even a full compliment of cup holders and grab rails for each seating position, along with seat belts. Everyone can stay hydrated while they remain safe and secure in their seats. A multi-function digital display saves dash space and resembles the ones that many cars come with these days. Other car like items include the the center mounted hand brake, two 12v accessory outlets - one each front and rear, and of course the four doors. Regular maintenance is easy with good access under the hood. A few other things worth mentioning are the full roll cage that extends outside the body for better protection. The extended fenders that help minimize splashing. A cargo bed that's about half the size of the 2 seater, but surprisingly functional. And maybe the most important feature, top quality Maxxis all-terrain tires. We'll include complete specs at the end of this article, so we won't bore you with all the nitpickin' details here. Let's just get to what everybody really wants to know - how does this thing drive? It's obvious that the Teryx4 is more suited for tighter situations than full throttle, high speed, open spaces. The drivetrain continues that theme. Low and mid range power are good, in a laid back, flat, smooth delivery kind of way. 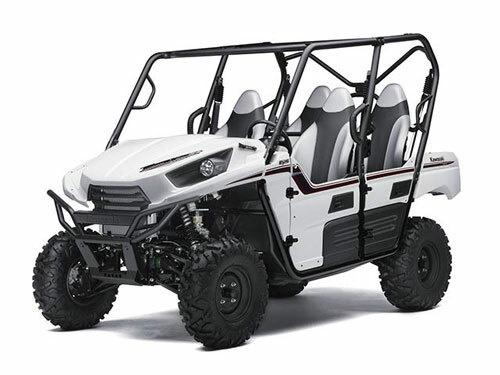 Top speed is limited to 50 mph, so there's no high power speed rush with this UTV. We really noticed the difference that the new clutching system makes, especially at lower speeds and more tedious driving that requires precise throttle control. This is how all CVTs should work! If you plan to use a side by side 4 seater on tighter trails, or for lower speed chores like towing, this drivetrain is hard to beat. We really enjoyed the Teryx4 on trail drives, where throttle response and good torque matter a lot more than all out horsepower. Another change we liked was the move to an electrically controlled front differential. The dash mounted switch is much easier to use than the old hand lever that still comes on the the 2 seat Teryx. Since power steering now comes standard on the 2013 Teryx4 models, it's no problem to lock in 4wd without having to worry about the steering wheel being wrenched out of your hand in rough terrain. Teryx4 independent rear suspension with piggyback shocks offers sporty handling. As long as you realize the Kawasaki Teryx4 isn't intended to be a high speed UTV, the handling and ride won't disappoint anyone. The shocks and 4 wheel independent suspension handle most terrain with no problem. There's a rear anti-roll bar to keep body roll within reason. The wheel travel and ground clearance aren't class leading, but are fine for the kind of use the Teryx4 is designed to do. That brings us to the power steering, the feature along with the new clutch that does the most to improve the driving experience of these side by sides. The difference it makes in rougher going is just amazing. It's not so much the easier steering effort, but the absence of all the violent kick back you would normally feel. 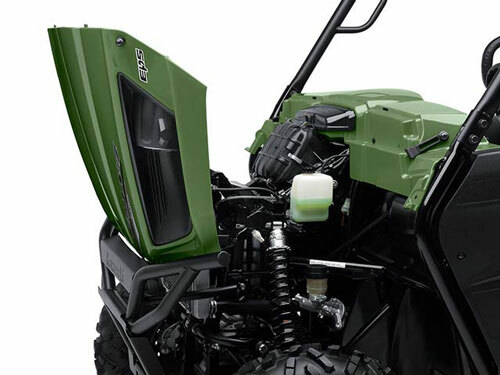 We completely understand why Kawasaki make it standard on all the 2013 Teryx4 models. Braking, much like the suspension, is adequate for this 4 seat UTV. It seems that reliability and ease of maintenance were bigger priorities than ultimate performance. The twin disc front and single sealed wet multi-plate rear brakes get the job done, just not quite as well as a full 4 wheel disc system would. Comfort for all four occupants of the Kawasaki Teryx 4 may very well be the best feature of all. It's one of the main things that makes it so attractive as a do-it-all side by side. We still can't believe how much room there is around each of the high back bucket seats in a UTV that's not much bigger than the 2 seat Teryx. The high back bucket seats, hand holds, and cup holders add up to a comfy environment for you and three companions out for a nice excursion. So where does the Teryx4 fit in the 4 seat side by side class? It's not the most work capable, it's not the fastest or best handling, it's not the biggest, it's not the cheapest, it's not the most powerful. It's not really at the top of any category we can think of, but it may be a strong contender for best all-around 4 seat UTV. That's because it's pretty good at most things and not terrible at anything. If you need a four seat RUV, if most of your riding is on tighter trails, if you want a UTV that's fun and easy to drive, if you want something that's reliable and easy to maintain, and if you value comfort over ultimate performance, the choices narrow. When you look at the combination of utility, performance, reliability, comfort, easy maintenance, price, and what we call the "grin factor", the Kawasaki Teryx 4 is going to be tough to beat. The base 2013 Kawasaki Teryx 4 model comes loaded with standard features. Those would include electric power steering, centrifugal clutch, front diff with electric switch control, piggyback shocks, two tone high back seats, and body color doors. Hands down the best value in the model line. The Teryx4 Camo model comes with body and wheels well wrapped with Realtree APG HD pattern camo. Seats are monotone black in keeping with the stealth theme. The LE models have all the standard features plus aluminum wheels and full composite roof. Guide to all Kawasaki Teryx models.